No More Heroes: Red Zone will be the game’s second port to the PS3, coming exclusively to the PlayStation 3. The first version, No More Heroes: Heroes’ Paradise saw more glitches and graphical issues than most of the recent PC releases. Going multiplatform didn’t seem to help the game’s reputation (and having a buggy release seem to have hurt it more). Lucky I didn’t fork out cash on release on that one since I bought both NMH and NMH 2 on the Wii ^^. 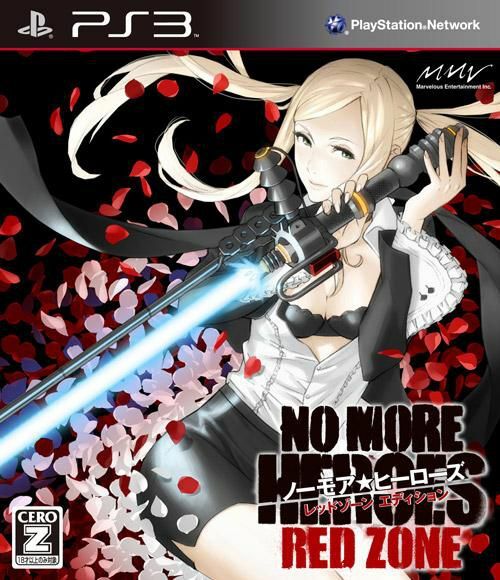 Unlike the previous HD release, No More Heroes: Red Zone will not be subjected to a tone down of the graphic violence (More blood and gore yes?). Of course with that announcement, you should expect what’s next. It’ll be an adult-only game (R18, R21 in some regions, completely un-buyable for some) and it’s a Japan-only release (for now). Argh! Z rating, meaning 18-and-up only. The PS3 version of Heroes’ Paradise was toned down for a D rating (even though the Xbox 360 version was Z). Boss Battle Mode that’s compatible with network rankings. You can face off against previously encountered bosses and upload your scores. Five popular boss characters from No More Heroes 2: Skelter Helter, Nathan Copeland, Kimmy Howell, Matt Helms and Alice Twilight. PS Move compatibility: control your Beam Katana directly for similar direct-style play as the Wii version. You can also just play with standard Dual Shock 3 controls if you want. “Forbidden View Mode” which lets you view all characters and Travis’ room using a free camera.